I've jumped the gun, according to The Mr, and partially moved into my new sewing space (Sewing Room Inspiration). I can't fully move in, because it still needs to act as a front entrance. I am moved in enough to be kicking myself for not realising years ago how big the area was. 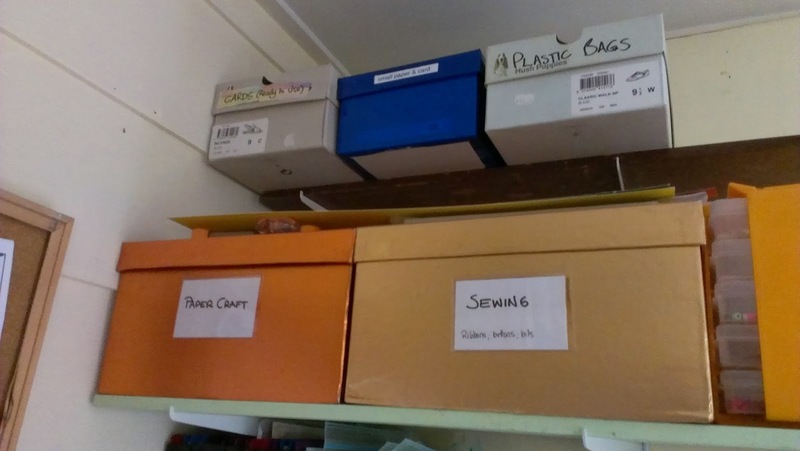 For the past 10 years my sewing room has primarily been just that - a sewing room, but I have also had to keep an awareness of it needing to covert to a guest bedroom. And the most recent incarnation was supposed to also be available as a sitting room. The room has a full wall of 50cm deep shelves. Perhaps that doesn't sound very deep, but a standard bookcase is 30cm, and paperbacks will easily fit on a 15cm deep shelf. Deep shelves mean you can't have lots of little things; the stuff at the back gets lost, knocked over, and generally isn't easy to use. 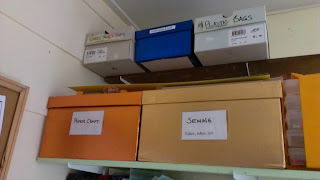 I found the easiest way to organise my stuff and keep the multi-purpose space tidy was to keep everything in boxes. I went to the cheap shop and bought the biggest gift boxes they had. From the stationery shop I bought sticky business card holders (I think they're designed to go the front of conference folders to take name labels). I like the plastic slips because it's easy to change the label without it becoming messy. I also kept shoeboxes; some got covered, some just got used. I piled like-stuff into a box and labelled it. Some boxes I filled with zip lock bags of stuff. My 'sewing stuff' box had bags of zips, ribbons, lace, etc. This is not a bad way organise a space. It has worked for me for a number a years. The biggest hassle I had was that I didn't have a 'shelf per box', so boxes were stacked. Sometimes a heavy box ended up on top, which made getting lower boxes out a little tricky. In my new space; however, I do not want big boxes filled with 'stuff'. I want lots of little containers, in single rows on shelves. I already have a set of 15cm deep shelves on one wall, and I will definitely be adding more to the space. Obviously, not everything can be stored on a narrow shelf, but lots of stuff can. My plan is to gradually post how I'm storing various 'stuffs'. As I'm trying to keep costs to a minimum, there's lots of imaginative recycling and reusing happening.